Have you heard of Thiocell yet? It's the newest whitening product to hit the market brought to you by Brady-Pharma. Brady-Pharma provides affordable, high quality innovative solutions in pharmaceuticals and cosmetics for its consumers. The difference between ThioCell and other ingestible whitening pills is that it is chewable. A small difference that creates wonders. Being chewable, it means the body absorbs the glutathione more quickly and effectively through oral cavities instead of the stomach. Thiocell also features a unique combination of Vitamin C, Selenium and Glutathione. The unique combination replenishes the glutathione levels in the body and maintains it. Aside from its whitening and anti-aging benefits, Thiocell is also beneficial for diabetic patients with fatty liver. A Theocell lozenge is about the size of a fat 25 centavo coin. It has a yummy, candy-like grape flavor. 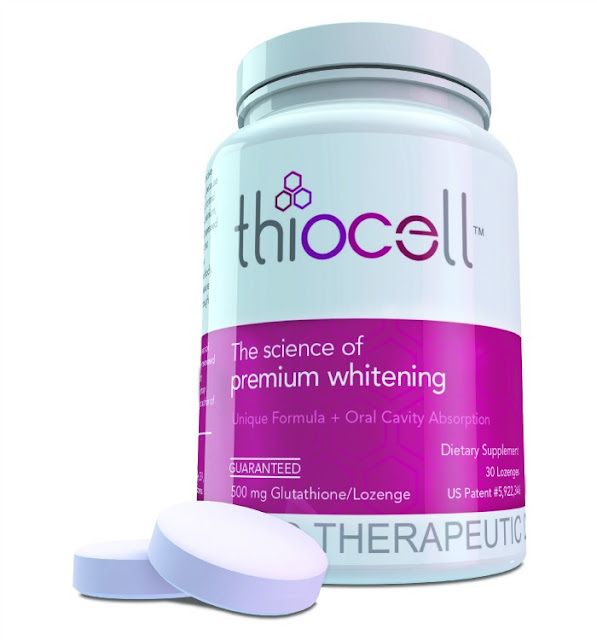 Each bottle of Thiocell Glutathione contains 30 chewable tablets and costs P2,400. Hi is this available in the pharmacy? Is this available in any pharmacy?